Developing a brand or rebranding a program for your aerospace business is not for the faint of heart. The second step is visually communicating your new brand and applying it to all aspects of your business. This is the tangible application that creates a strong and unified front for your firm. But with it comes a long laundry list of items that will need to be updated to represent your new brand. 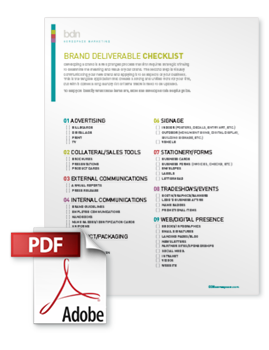 To help you identify what these items are, BDN has developed a Branding Deliverables Checklist. You've crossed the rubicon and all the decision makers have blessed your new brand look and feel. Now what? How do you get everyone else in your organization on board? Fear not. Next week we'll be looking at how to establish brand standards and what to include in your brand guidelines.